Over 50% of men and women will experience thinning hair at some point in their lives, which will usually lead to hair loss and eventual baldness. The good news for those experiencing thinning hair is that now is the best time to act. Thinning hair, or in other words, the early stages of hair loss, is the best time to reverse the problem and will ensure the highest chances of a full recovery. After years of treating thousands of cases of thinning hair, The Belgravia Centre has found by closely monitoring every case, that the problem can almost always be fully reversed if caught at the early stages. This means that the hair thinning will be stopped and the hair’s appearance could visually return to its original state from the use of a Belgravia treatment course. Our hair loss success stories are testament to this – they contain comments from patients who have received success from a Belgravia treatment course – taken from our clinic comments books, the Belgravia Facebook page or Google+ pages – alongside their hair growth photo-scans (which are taken of every patient who visits one of our clinics). But what’s the difference between thinning hair and hair loss? The terms ‘thinning hair’ and ‘hair loss’ have very similar meanings and are commonly confused. Thinning hair refers to the early stages of hair loss, where the hair shafts begin to thin with each growth cycle. Thinning hair is usually caused by the effects of DHT on the hair follicles (see male hair loss or female pattern hair loss pages) but can sometimes be caused by other hair loss conditions. Once thinning hair has progressed to the point where some hairs have thinned so much that they become ‘vellus’ – fluffy white hair which is not always visible to the human eye – this is referred to as ‘hair loss’. Once thinning hair has passed the point of general hairloss and all or most of the hair on the top of the head has become vellus, where the head appears shiny, this is referred to as baldness. What’s the difference between men’s and women’s thinning hair? General female hair thinning conditions are usually limited to women’s hair becoming diffusely thinner. Men’s hair thinning will generally result in baldness without treatment, although this is not always the case and depends on the severity of the condition. Although most women with thinning hair – whether caused by genetics, diffuse hair loss or telogen effluvium – will experience hair loss as well as thinning, women will not usually reach the point of complete baldness. 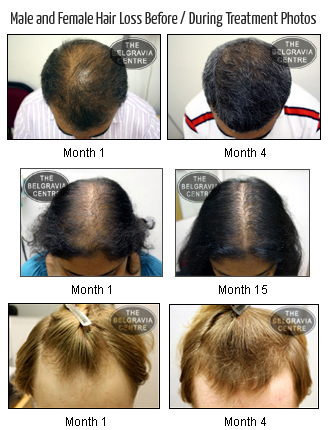 How does The Belgravia Centre achieve such promising levels of hair regrowth? The Belgravia Centre has specialist in-clinic hair loss pharmacies which can provide treatments, including a range of high strength minoxidil products – to find out more, please contact the clinic. These products are effective in treating many patterns and levels of thinning hair. Our hair loss treatment programmes have helped many thousands of men and women to sustain and improve their hair density.